Happy, warm, and hungry. Baby potatoes with tarragon. This is a hardly a recipe; it’s more of a warning: If you do not make these potatoes, your life will have a teeny-tiny potato void in it, halfway between your heart and your stomach. It might not seem like much, being so teeny-tiny and all, but I assure you, it will sting. I didn’t even know I had this void before last night; it was, I’ll admit, easily filled with all the other potatoes that I had braised for countless dinners before. 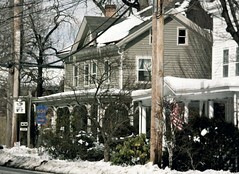 Those potatoes, with their crispy, browned skins and mashed-potato-y white interiors, are enough to please. It’s easy not to go looking for more when you already have such a good thing. Thankfully, more found me yesterday afternoon, in one of my favorite places (second only to my screened-in third-floor porch on the first warm day, when winter seems behind me), my butcher’s. Just thinking about my butcher’s, which has been written up twice by the New York Times, makes me feel happy, warm, and hungry. The two butchers, Emil and Joe, may seem stand-offish at first, but ask them about their meat, or tell them the recipe that you’re planning, and let them lead the way for you, and they soften right up. Become a loyal customer, and you get smiles and jokes and that happy, warm feeling I’m talking about. (You also get a bit of a panicky, distressed feeling because they are pretty old and may be retiring and you don’t know what you would do without them.) They always know the best cut to use, and their meat is the best. 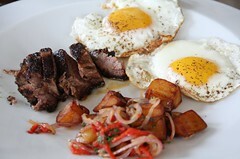 They’ve got eggs from their farm and hand-picked grocery items. And yesterday, they had teeny-tiny baby potatoes with yellow flesh that proved beyond creamy, with soft, thin skins. We bought almost all of them—leaving only about half a pound, because I felt guilty and another customer was leaning menacingly over my shoulder as I pillaged the goods. I had already decided to braise them on the stove-top, in a little olive oil and tarragon, before we left the shop. I didn’t yet know how good they’d be. The braising method, it turned out, was fantastic. I’m sure it’s the best method to cook these young, creamy potatoes; they brown a little but are left mostly unadulterated. I’ll never be certain if it’s the best method, however, because I’m sure I’ll never try them another way. They were perfect. The tarragon braises down and imparts a nutty—not anise-y as it does raw—flavor. The result is not quite crispy but brown on the outside, a little nutty, and oh so, ohso solidly creamy and buttery and golden on the inside. 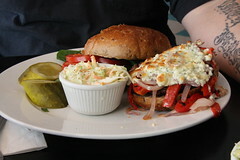 We ate them with our fingers, alongside seared scallops and arugula, and it was one of the best meals we had ever had. Just thinking about it, I feel happy, and warm, and hungry. If you can find teeny-tiny baby potatoes, which look a lot like fingerlings, use those. In a (preferably nonstick) pan, warm your olive oil over medium heat. Scatter your potatoes, the pan should be big enough that you don’t need to overcrowd, with the potatoes hardly overlapping (a little is ok). Throw your tarragon, salt and pepper in. Add enough water to come halfway up the sides of the potatoes. Cover the pan and cook for about 20-25 minutes, until the potatoes are tender, checking at about 15 minutes in case they’ve cooked quickly. Take the lid off the pan and cook until the water evaporates, stirring very gently with a spoon or silicone spatula so that the potatoes brown on all sides. Serve hot, with a drizzle of olive oil. Next Post Celery Root and Okra Dal. Oh braising potatoes are my new favourite way of making them, instead of putting it in the oven for 45 minutes, I just love love love putting them in the pan and braising it with a little chicken broth and herbs. So tender and mmmmmmmm. Yes, chicken broth is a good idea here. I use it when I have some around, but my last batch of broth was a bit too cloudy and I’m currently boycotting it. 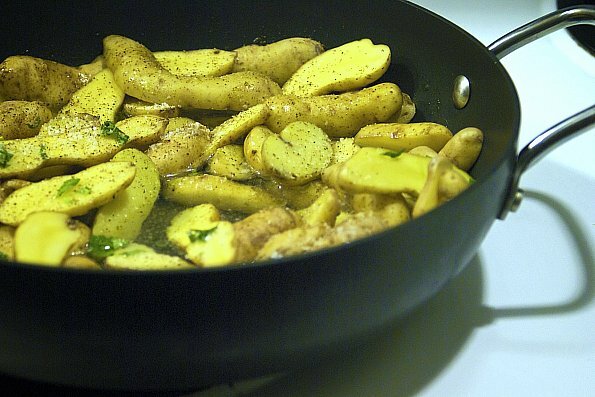 Thes spuds look freakin’ delish…tarragon would be wonderful with them. These potatoes sound AND look delicious. 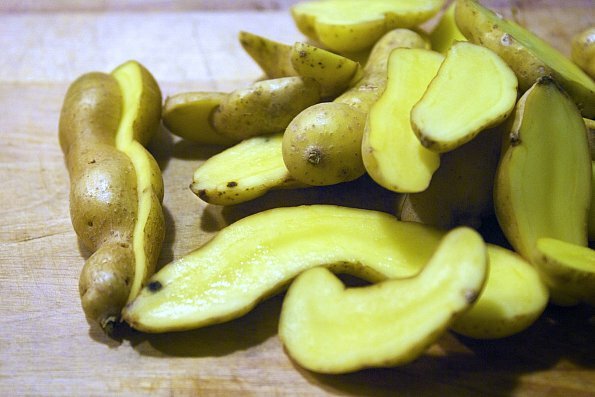 I am a big fan of fingerling potatoes, so I should definitely try these! The potatoes have such wonderful shape. Almost too cute to eat… Almost. Without baby potatoes I would surely have more than a tiny hole in my heart. Oh, I LOVE baby potatoes. Thank you for reminding me why – these photos are gorgeous. I can’t imagine anything better than crispy roast potatoes, but will try these based on your rave review. I’ve never braised potatoes on the stovetop. Are they better than roasting? They look lovely! Also, did you use any sauce for the scallops? How long to sear? I’m always trying scallops and messing them up! Thanks! 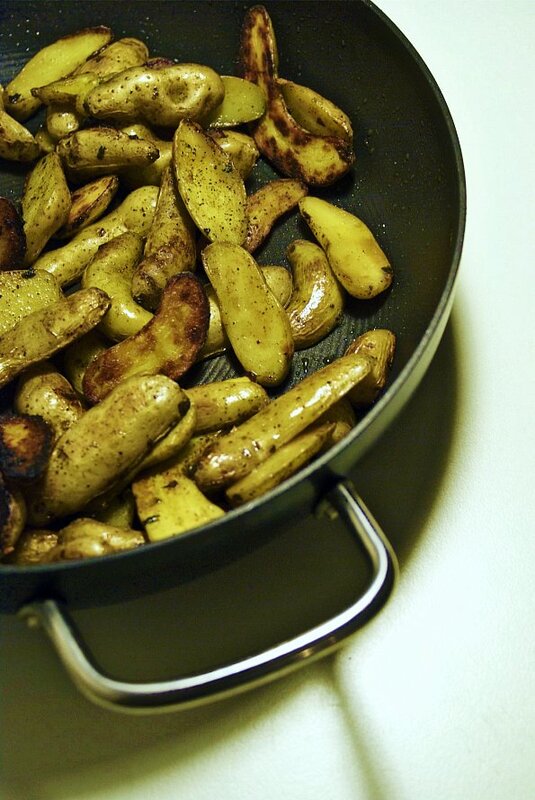 Stove-top and roasted potatoes are two different animals. I usually use stove-top for a lighter side, since they don’t get as blackened or intense as roasted. Perfect with fish or an herb-rubbed chicken. I find them creamier and also harder to mess up than roasted, too. For the scallops, we rendered a little bacon fat, then seared the scallops in about 1 Tbsp of the fat for about 2-3 minutes a side. Use a nonstick pan if you have one! So much easier. Then I made a vinaigrette from some of the bacon fat, mustard, vinegar, and a touch of hazelnut oil. It was delicious on top of arugula with these potatoes. I do love a good crunchy skin potato, rich and creamy and those little fingerlings are all over our Farmers Markets and now I want Spring. Now. But every time I look at the photos, I start thinking ‘Pickles’ and then I can’t help but chortle a little at the thought of pan-braised pickles. Haha. Maybe I’m sending wavelengths because I’ve been absolutely obsessed with cornichons the past few days. Dude, I’m a total tart for tubers. 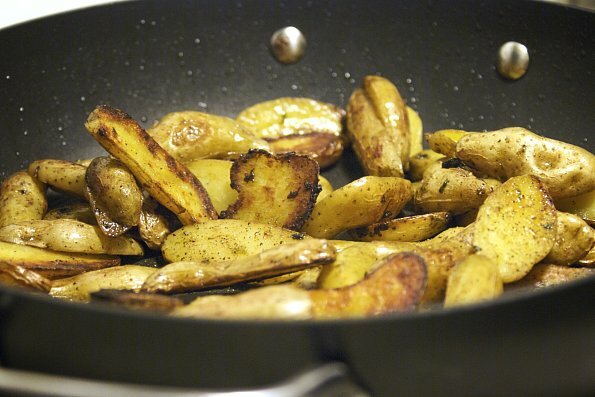 I love them baked, boiled, fried, roasted….and I also love tarragon. Now I feel like I’ve been lacking something all this time by trying to channel some sort of inner Greek and braising potatoes in lemon, paprika and chicken stock, when I COULD have been channeling a sultry inner Francophone and braising potatoes with tarragon. Sigh. Your finger(ling)s are lovely. In a less creepy way than that sounds. Total tart for tubers – love that. And not creepy at all, though I’d like to mention that my real fingers are indeed pretty lovely, minus the few nicks and burns. Now that’s pretty interesting, never thought to cook potatoes this way. Are you supposed to brown the potatoes in the oil first or essentially just simmer in the oil/water? They look real crispy! Just simmer away, then when you take the top off, you evaporate the water and the potatoes crisp up during the process. Really easy. I’ve never braised potatoes before! I’m so excited to try this! 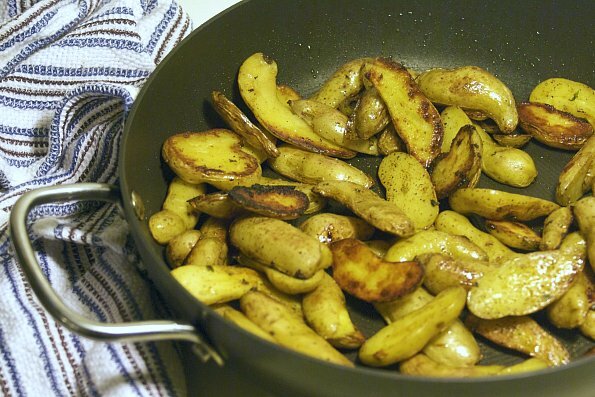 I will be making a bee line for the union square farmers market, one stand in particular has a huge assortment of teeny tiny potatoes that are just itching to be made into this recipe! Gorgeous shaped potatoes! I love fresh tarragon, and besides fish, usually don’t find a use for its delicate flavor. tarragon is seriously one of the happiest herbs on earth. i love it. it reminds me of spring and i can’t wait till my plant is in full bloom. i love this dish… LOVE it. soooo stealing this idea to go on the side of some bbq this summer. i bet you it tastes amazing cold. how stupid lovely this is. geesh! i loooove. i have both in my fridge right now and would not mind having with the cuban meatloaf i’m making for din din!